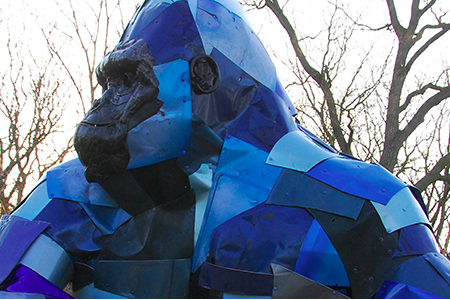 Artist Don Kennell crafted this blue gorilla sculpture out of recycled car doors. A crocodile made out of chewing gum, a gorilla crafted from recycled car doors and polar bear cubs made from used spark plugs – these are a few of the upcycled animal sculptures spotted throughout the Philadelphia Zoo. The art exhibit, titled "Second Nature," is on view now through Oct. 31. Its goal is to raise awareness of the environmental impacts caused by human consumption and pollution on animals. “Through an unorthodox art exhibit, making everyday choices that help wildlife around the globe will become ‘Second Nature,’” according to a description of the exhibit on the zoo’s website. The animal sculptures were crafted by artists from around the world. Philadelphia artist Leo Sewell created a rhinoceros from melded silver plate serving trays and other dinnerware. Read more about the "Second Nature" exhibit here.